This is exactly what has driven the design decisions for mobileAgent - only include things which make the most sense in a mobile situation, and keep some of Josh Clark's Tapworthy principles in mind at all times, especially "I'm Microtasking", and get in, do what you need to do, and get out as quickly as possible. And as a special bonus, here's something I'm working on for the next version. 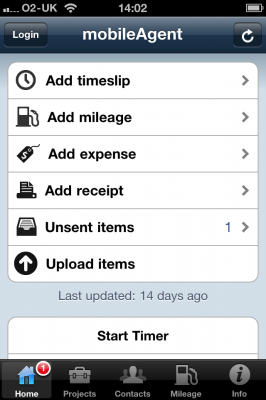 Uploading images with your expense was a great idea, but personally, I seldom use expenses - I use the company debit card when I want to spend some company money. Doing this, I still need to keep the receipts for later upload into FreeAgent, so I've added the same receipt capture function in. 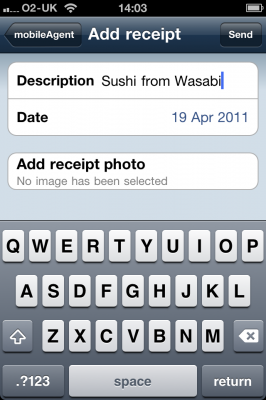 Add receipt allows you to take a photo (and give it a date and description), and the image will be either emailed to you (working right now), or uploaded to your DropBox account (still working on this bit). This extends the story of "capture it when you do it" that is at the core of mobileAgent, but it gets around the lack of access to bank statement lines in FreeAgent. An ideal solution would be to upload the image to FreeAgent, and be able to select from a "receipt library" when you reconcile a line, but until FreeAgent implement that (I did ask them - hint hint :) - but I get that it's not even remotely core functionality! ), DropBox or email will have to do.